Performance Practice in the Music of Steve Reich provides a performer's perspective on Steve Reich's compositions from his iconic minimalist work, Drumming, to his masterpiece, Music for 18 Musicians. 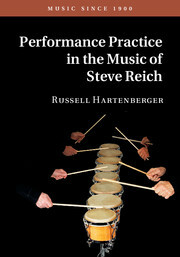 It addresses performance issues encountered by the musicians in Reich's original ensemble and the techniques they developed to bring his compositions to life. Drawing comparisons with West African drumming and other non-Western music, the book highlights ideas that are helpful in the understanding and performance of rhythm in all pulse-based music. Through conversations and interviews with the author, Reich discusses his percussion background and his thoughts about rhythm in relation to the music of Ghana, Bali, India, and jazz. He explains how he used rhythm in his early compositions, the time feel he wants in his music, the kind of performer who seems to be drawn to his music, and the way perceptual and metrical ambiguity create interest in repetitive music.